Background: Aberrant miRNA expression is associated with the development of several diseases including cervical cancer. Dysregulation of miR-125a-5p is present in a plethora of tumors, but its role in cervical cancer is not well understood. Objective: The aim was to analyze the expression profile of miR-125a-5p in tumor and immortal cell lines with further target prediction, validation and function analysis. Methods: MiR-125a-5p expression was determined by real-time RT-PCR from nine cervical cell lines. In silico tools were used to find target transcripts with an miR-125-5p complementary site within the 3'UTR region. Further target selection was based on gene ontology annotation and ΔG analysis. Target validation was performed by transfection of synthetic miR-125a-5p mimics and luciferase assays. Functional evaluation of miR-125a-5p on migration was performed by transwell migration assays. Results: Differential miR-125a-5p expression was observed between immortal and tumor cells regardless of the human papillomavirus (HPV) content. Thermodynamic and ontological analyses showed Microtubule-Affinity-Regulating Kinase1 (MARK1) as a putative target for miR-125a-5p. An inverse correlation was observed among miR-125a-5p expression and MARK1 protein levels in tumor but not in immortal cells. 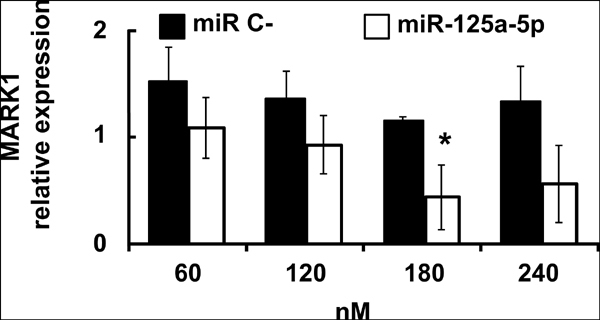 Luciferase assays showed direct miR-125a-5p regulation over MARK1 through recognition of a predicted target site within the 3'-UTR. HeLa and C-33A cervical tumor cells enhanced migration after transfection with miR-125a-5p mimics and stimulation of cell migration was reproduced by siRNA-mediated inhibition of MARK1. Conclusion: The results showed MARK1 as a novel functional target for miR-125a-5p with implications on cell migration of tumor cervical cancer cells. Keywords: Cell migration, cervical cancer, MARK1, microRNAs, miR-125a-5p, tumor. Keywords:Cell migration, cervical cancer, MARK1, microRNAs, miR-125a-5p, tumor. Abstract:Background: Aberrant miRNA expression is associated with the development of several diseases including cervical cancer. Dysregulation of miR-125a-5p is present in a plethora of tumors, but its role in cervical cancer is not well understood.